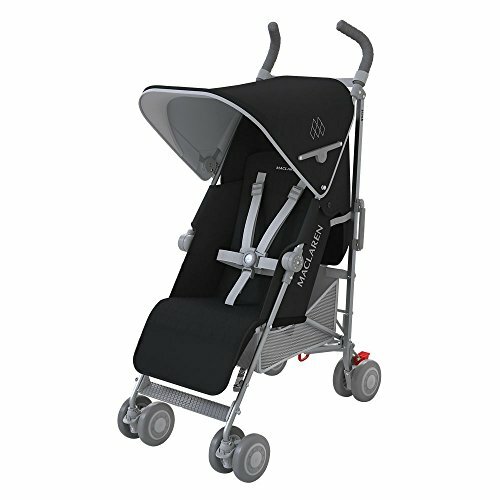 Moms like having choices and they also love the design and features in the Maclaren line. The Quest stroller comes in a variety of contemporary color schemes for moms who want an alternative to all the “cute” color combinations in other brands. For active parents on the go, the Maclaren Quest provides a lightweight solution, yet provides the comfort your child needs such as adjustable leg support. These extra features are a step up from the Maclaren Triumph, and parents feel it is well worth the price for these comforts for their child. This is the product for you if you want something light weight that does not sacrifice features. As you read through this review you will discover the detailed differences between this stroller and the Triumph. You will also find out why customers give the Quest a high rating. Some have compared it to the similarly featured UPPAbaby G-Luxe, one of the better umbrella strollers on the market. And you will also discover what Consumer Reports has to say about the Quest toward the bottom of this review. The similarly featured Triumph has everything this stroller has, however the Quest has 4 extra features listed below, and thus the more expensive price tag. You may find these features worth the extra price, if not you should consider the Triumph. 2 What is the fold like? 4 Tell me about the sun canopy. 5 What about the seat? 6 Why do moms and dads love this stroller? 9 Where can I buy the Maclaren Quest Stroller? 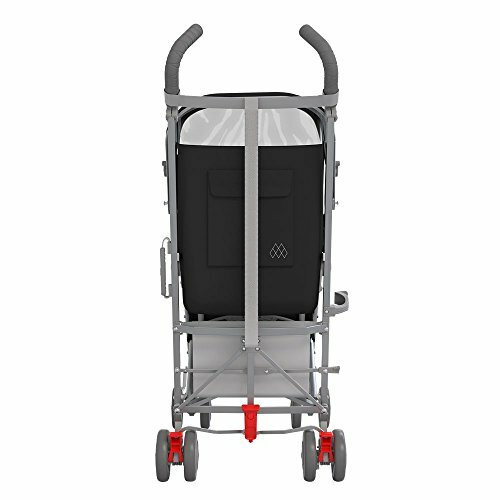 I like how the Maclaren Quest stroller has convenient, comforting features while maintaining a light weight of just over 14 pounds because of the high strength aluminum frame. Your baby can be a newborn to ride in this stroller and it holds a child up to 55 pounds. The smooth ride and maneuverability is a pleasure to take on long walks. Since the front wheels have the option to lock into place, you’ll have more stability on bumpier surfaces and the 5-inch wheels certainly help with that. I took mine over grass, bumpy sidewalks and park mulch with 30 pounds in the seat and it went over it quite well. Folding can be tricky the first time, but I got it right after a few practice runs. Several parents are inlove with how easy the fold is, but do keep in mind that you have to empty the storage basket first. I made that mistake and squished my purse! Once your stroller is folded, an automatic lock holds the frame in place. A carrying strap and a handle on the side of the frame make it a popular stroller for travel. I found that when I held the Quest by the handle, the stroller felt well-balanced and easy to carry. While having a reclining seat is a real plus, the Quest gives you not two positions but four! Now you can find that perfect angle your child will be most comfortable when it comes to napping or relaxing. Comfy! And for newborns, provide a sense of safety and cocooned comfort by surrounding your young baby in the foot and head barriers. You will feel more at peace seeing your little one safely enclosed. Finally, Maclaren has listened to their customers and have upgraded their sun canopy! This new canopy is bigger and extendable. It has a rear zip-away panel with ventilation windows for good air flow. The flip-out sun visor provides additional shade. I like that there’s a viewing window at the back of the canopy, and here you can see the carry strap and convenient storage pocket on the back. The Quest has more padding than the Volo and Triumph and in addition, it has an extending leg rest feature. I like the leg rest because it pulls out on either side of the seat to give your smaller baby the support needed when their legs are so short. If you feel you need some more padding, however, choose from dozens of different Maclaren seat liners; liners also help protect the seat and give that splash of color that makes your Maclaren uniquely yours. Aren’t these just fabulous? Which one is your favorite? Maclaren strollers have a very good buckle on the five-point safety harness. To release the buckle, you must press on both sides of it to release, and that makes it virtually child-proof. If your child is a little Houdini, this is a solution you will appreciate. You might even need to practice with the buckle a few times yourself – I know I did! The harness is easily adjustable to accommodate your growing child by re-threading the straps in the seatback. Why do moms and dads love this stroller? Parents who are above average height love the handles because they don’t have to stoop down as they do with other strollers the same size and they don’t kick the back while walking. I appreciate the linked parking brakes, stepping down only down one time to engage the brakes and have my stroller come to a complete stop. Choose from the middle pedal, left or right, or the levers over either rear wheel. Very flip-flop friendly. The mesh storage basket beneath the seat can hold a small purse and some other smaller baby essentials, but since it is an umbrella stroller, the fact that it has a basket at all is a huge plus. I could put my medium-sized purse and camera in the storage basket, but you’re not going to have enough room for a full-sized diaper bag. If this is not enough storage for you, you might consider getting the Maclaren Universal Organizer, which can hold your drinks and has a big mesh pocket that hangs down between the handles. However, the J.L. Childress Cups ‘N Cargo Stroller Organizer is cheaper and it has better reviews. 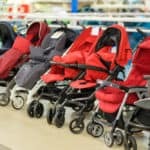 The ergonomic foam-padded handles are comfortable for long periods of use and Maclaren strollers are famous for having handles high enough for most adults. I found it quite comfortable when I pushed it and I’m 5’7″ – just average height. I did find myself occasionally bumping the back with my toes when I was walking especially fast – but keep in mind that this is not an exercise stroller, so it’s no problem. Caught out in the bad weather? A rain cover is included and can be kept in one of the storage pockets on the back of the canopy. Here’s a new video review that I think you will find helpful! 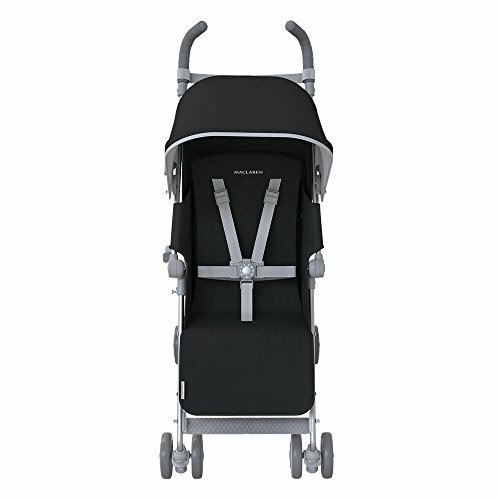 Width: 17½”Handle Height: 41½”Length: 31½”Wheel size: 5″Stroller weight: 12.6 lbs. Maclaren Quest reviews have generally been quite positive across different web retailers. Consumers give this stroller a high rating and mention how comfy the stroller is for their child, the light weight and smooth ride. Consumer Reports gives this umbrella stroller “Very Good” marks across the board for Safety, Ease of Use and Maneuverability. They said the fold was easy and the extra pocket in addition to the basket was nice to have as added storage. The only downfall mentioned was that the buckle was sometimes difficult to open and close. I personally liked how the Quest came already assembled when it was delivered to my home. I just pulled the stroller out of the box, took off all the plastic protection and installed the hood. That’s it! 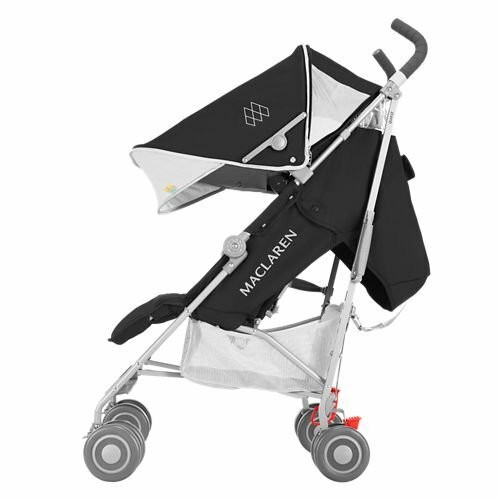 The Maclaren Quest receives the most positive feedback for its light weight and smooth maneuverability. 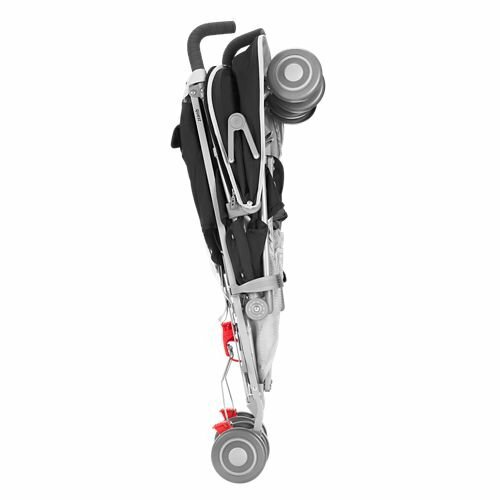 This stroller is a popular choice for traveling families going to theme parks where they have to get in and out of shuttles often, and also for families taking an airplane and don’t want to gate-check their stroller. Parents do mention gate-checking, however, and said it was quite simple. Urban-dwelling parents taking public transportation will also find the Quest a clear choice. This stroller is a dream for city families. Some moms and dads who give five and four-star reviews still remark that they don’t like the storage basket size. Parents wish it was bigger and they also want cup holders. Many purchase the universal organizer, which has a netted bag-like storage compartment and cup holders that hang off the handles. 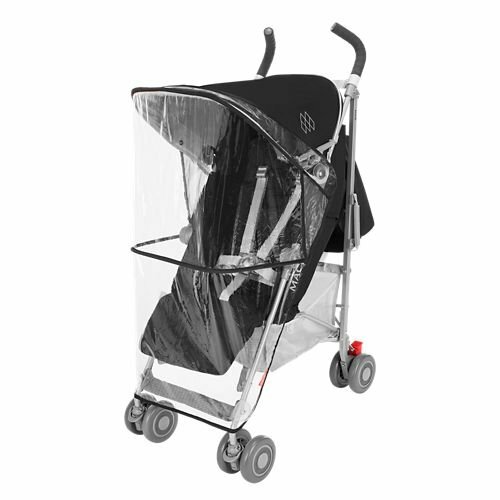 Keep in mind that umbrella stroller baskets are small by necessity and by design! Parents commented that they cannot access the storage basket at all once the seat is reclined, even a little bit. And another complaint that has come up several times is that once this stroller is folded, the wheels touch the canopy, soiling it. Where can I buy the Maclaren Quest Stroller? The best place to go for the widest range of color choices of this stroller has got to be on Amazon. You cannot go wrong with the prompt service and free shipping. Imagine your easy outings with your little one in your new Maclaren Quest!